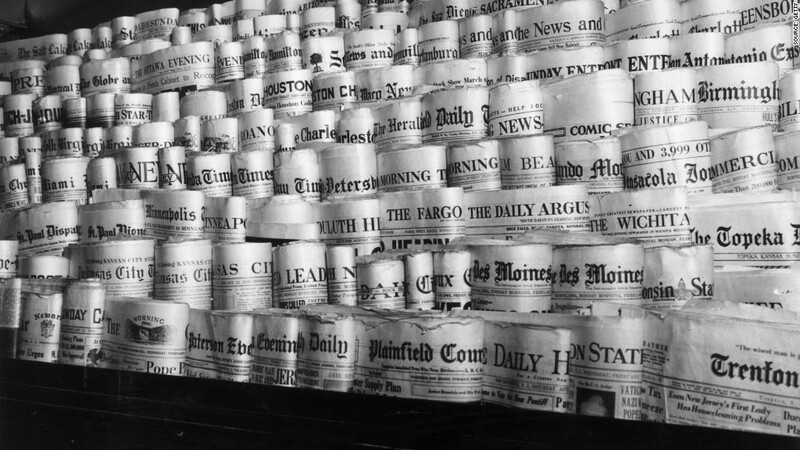 Can newspapers stop the "I got my news on Facebook" trend? The Wall Street Journal is giving up on printing newspapers for Asia and Europe. The 128-year-old paper will stop publishing its European edition on Friday, and its Asian edition a week later. The Wall Street Journal has been part of Rupert Murdoch's News Corp (NWS) empire since 2007. Falling overseas sales and plunging print advertising revenue in recent years drove the decision, according to the Journal. The paper will now focus entirely on its digital operations in the two regions. The move brings to an end the Journal's run of more than 40 years of print editions in Asia nearly 25 years in Europe. It plans to print its U.S. edition daily in some cities like Tokyo at a later date. The closure come as parent News Corp struggles with declining print circulation and advertising revenue. Both of those fell in the last year, the company's most recent annual results show. News Corp made a loss of $643 million for the year. Overseas sales and subscriptions of The Wall Street Journal have fallen in recent years. Across Europe, the Middle East and Africa, print sales dropped to 49,000 in the second quarter of this year, from 59,000 a year earlier, according to company data. In the Asia-Pacific region, they fell to 45,000 from 54,000. The U.S. edition has print sales of more than 1.1 million. Over the last year, Dow Jones has been pursuing its "WSJ2020" strategy as tries to shift more subscribers over to digital platforms. As part of this, the Wall Street Journal has closed bureaus in Europe and let go of editorial staff in Asia. It's not the only U.S. newspaper to have made cuts to its overseas print operations recently. The New York Times said last year it was axing as many as 70 jobs by closing its editing and pre-press print production operations in Paris.